Saw this on Rising Sun of Nihon and just had to post it. And you thought the Play Station 3 was overpriced. 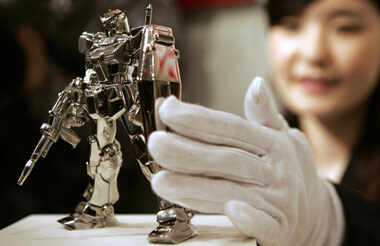 How about a “Gundam Fixed Platinum?” Japan’s Ginza Tanaka and toymaker Bandai Co. unveiled a miniature of Japan’s famous animated robot character – “Gundam.” The, um, little fellow weighs in at a mighty small 1,400 grams (45oz) and stands 13cm (5″) tall. AND…he is made of pure platinum. Aren’t you glad it’s just a miniature? At today’s prices, melted down, he would go for $41,468! What’s the dumbest thing you think someone can make out of platinum? Wow! Is that a toy? or a precious treasure? Visit this site to see some more very expensive collectibles ever made. Thanks! I really want this. Only if it was cheaper or I could win it. Being the Gundam fan I am this is awesome.